Wayne Bailey’s influences during the 15 years he’s owned Youngberg Hill include Robert Brittan and the late Jimi Brooks, but this 6-acre block named after his oldest daughter got its start with iconic Ken Wright. He oversaw its planting in 1989 back in the early days of historic Panther Creek Cellars. Bailey continues to make history by using the Natasha Block’s clonal makeup of Pommard and Wadenswil, and during the historic warm 2015 vintage harvest arrived Sept. 24. Bright cranberry, subtle white pepper, and sweet raisin aromas lift from the glass and invite a sip, which delivers a surprising herbaceous note, followed by beautifully tart rhubarb and finished off with a touch of dusty tannin. 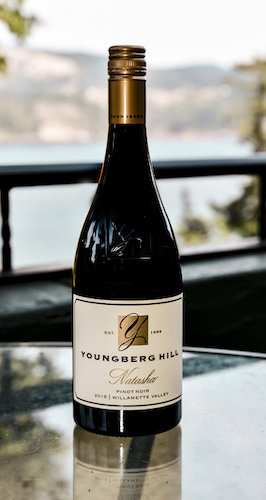 It was one of two expressions of Pinot Noir by Youngberg Hill to win a gold medal at last fall’s Great Northwest Invitational Wine Competition. Suggested pairings include duck breast, baked salmon or pork tenderloin.